Imaginary money ready for wagering! My money’s on the Chandra deck. It has fast burn, but with some answers for the mid to late game too. All these decks are foreign to me except maybe Divine VS Demonic. I will still be placing my imaginary bets though! Apart from that, white swarm decks (such as the recently covered Bashers) or strong tribal decks (such as Vampires) have proven to hold their position no matter which environment they’re thrown into. This is ’08-’09 championships. If I remember right we’ll be seeing all the Alara decks, Jace VS Chandra, Divine VS Demonic, and possibly the online decks that came out in that time. 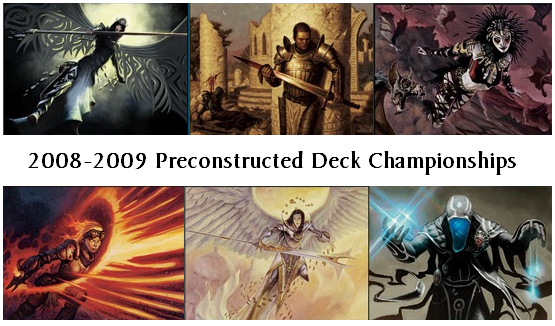 After lengthy consideration, I decided that I was not going to include the MODO-only decks in the competitions. True, there were a quartet released during this time period, but it opens a bit of a can of worms- the Legacy decks recently released would have a huge competitive advantage over their more ‘mundane’ kin, for instance. Hope you’re not too disappointed! Someday we’ll be visiting them for review, but for the Precon Championships purposes, it’s paper only.